Get inspired by colleagues at work who've run marathons. Charlie completed the London marathon and Sarah ran the hilly Brighton course. I got carried away while watching the London runners on TV. 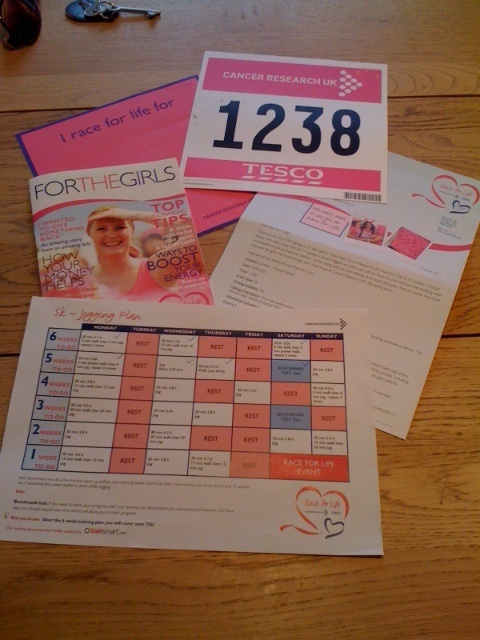 Next thing I know I've signed up for the Race for Life 5 km on Sunday 5th June in Crystal Palace. I'm very excited at the prospect of getting to run in the National Sports Stadium (bit of an armchair athletics geek if truth be told). Those Primarni jogging trousers are getting a real workout. My house keys have cuts holes in both pockets. I'm running out of t-shirts. Probably need to get a better pair of trainers before the race day. You can always find out what you need to know on Twitter (they should tell that to famous footballers). Me? I asked the Twitterverse which app to use for training. Runkeeper was pretty much the universal recommendation. But beware. It's only as good as the GPS signal. I live in an area with trees. And clouds. And the wrong kind of air. Or something. Seems to be a problem at times. Still, it's handy to work out local routes. I drink a lot of water anyway. Never more so than when I'm staggering around the streets of SE21 gasping for air. I'm now the proud owner of a runners water bottle complete with handy hole in the middle with grip so it doesn't slip out of my sweaty hand. Water drunk during training to date: 11.2 litres (approximately 700ml per training run). 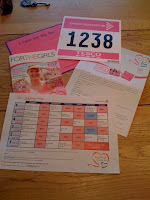 The Race for Life website has a range of training plans. I chose the marginally more ambitious Joggers 5 km plan (rather than beginners/walkers). So far, I've run 54 km in the first 4 weeks of training. I've got another 26.3 km to go before the race. It may be a bit more than that, depending on the GPS. There'll be a few stretches, warm-ups and warm-downs in between. There are plenty of people I know who are directly or indirectly affected by cancer. I'm kind of running for them all. But I want to dedicate this race to three people. My father-in-law has recently started treatment for prostate cancer. My best friend's mum has just been diagnosed with small cell lung cancer. Her dad has been simultaneously diagnosed with prostate cancer. Their names will be on the back of my t-shirt on the 5th June.